CUP SAUCER & PLATE / TRIO. excellent condition. The Glamis Thistle is said to be found near. Royal Doulton Grantham Pattern D5477 thus pattern was produced between 1934 until 1964 and is now discontinued. 1st Quality. Royal Doulton Brambly Hedge ( Four Seasons Pattern 1983 ) 1st Quality. Gilding to Top,Base and Handle. Creamy White Background with Peach, Pink and White Floral and Foliage Decoration. Here we have a fantastic set of the highly sought after "Royal Doulton" porcelain pottery. As you can see, there is a tea service plate/tray, a miniature Autumn tea cup, saucer and small plate up for grabs here! ROYAL DOULTON " CANTON ". however, bubble wrap is always used in abundance. 1ST QUALITY. 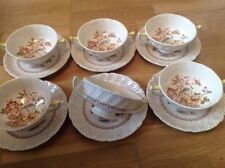 Royal Doulton "Old Colony" 9 x cup and saucer sets. 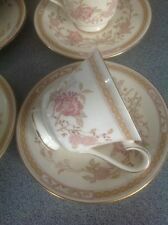 Royal Doulton English Rose pattern. 4 Soup Coupe Bowls and Saucer Stands. Bowls have minimal signs of surface utensil use, if at all. Three saucers have extensive crazing as shown. Grading - I generally use the scale: Poor; Fair; Good; Great; Excellent. Royal Doulton 'English Renaissance' soup coup and saucer in really good used condition and of first quality. Price is for one soup coup and saucer. Look to be little used, if at all. ROYAL DOULTON. Ask for details if applicable. will be higher. PRACTICAL, HARD WEARING AND PRETTY. UNLESS OTHERWISE STATE ALL CHINA AND GLASS WILL BE SOLD IN GOOD USED CONDITION. ROYAL DOULTON EVERYDAY AUGUSTINE CUP and SAUCER. ROYAL DOULTON EVERYDAY AUGUSTINE CUP and SAUCER.. Dispatched with Royal Mail 2nd Class. Manufacturers seconds hardly used. No cracks or chips. Will combine postage for more than one set. Please contact me for an estimate. Brambly Hedge Poppy's Babies Cup and Saucer - Boxed. A RARE and now hard to find “Poppy's Babies” cup and saucer designed by Jill Barklem from the Royal Doulton Brambly Hedge Collection. This decorative cup and saucer are now discontinued but these are first quality in excellent condition. Royal Doulton Mandalay Fine China Saucer (approx 6" / 15 cm). Madalay saucer from Royal Doulton (Staffordshire). ROYAL DOULTON VANBOROUGH PATTERN H4992 SOUP COUPE & SAUCER. If the item is new or in new. unknown manufacturers and/or patterns, etc. We do our best to specify the.